(Nanowerk News) To make robots more cooperative and have them perform tasks in close proximity to humans, they must be softer and safer. A new actuator developed by a team led by George Whitesides, Ph.D. — who is a Core Faculty member at Harvard’s Wyss Institute for Biologically Inspired Engineering and the Woodford L. and Ann A. Flowers University Professor of Chemistry and Chemical Biology in Harvard University’s Faculty of Arts and Sciences (FAS) - generates movements similar to those of skeletal muscles using vacuum power to automate soft, rubber beams. Like real muscles, the actuators are soft, shock absorbing, and pose no danger to their environment or humans working collaboratively alongside them or the potential future robots equipped with them. The work was reported June 1 in the journal Advanced Materials Technologies ("Buckling Pneumatic Linear Actuators Inspired by Muscle"). "Functionally, our actuator models the human bicep muscle," said Whitesides, who is also a Director of the Kavli Institute for Bionano Science and Technology at Harvard University. "There are other soft actuators that have been developed, but this one is most similar to muscle in terms of response time and efficiency." 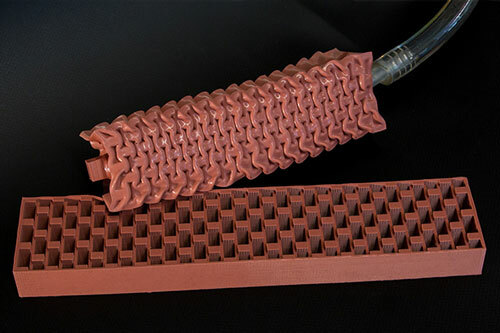 The actuator — comprising soft rubber or 'elastomeric' beams — is filled with small, hollow chambers of air like a honeycomb. By applying vacuum the chambers collapse and the entire actuator contracts, generating movement. The internal honeycomb structure can be custom tailored to enable linear, twisting, bending, or combinatorial motions. "Having VAMPs built of soft elastomers would make it much easier to automate a robot that could be used to help humans in the service industry," said the study’s first author Dian Yang, who was a graduate researcher pursuing his Ph.D. in Engineering Sciences at Harvard during the time of the work, and is now a Postdoctoral Researcher. "It can’t explode, so it’s intrinsically safe," said Whitesides. "These self-healing, bioinspired actuators bring us another step closer to being able to build entirely soft-bodied robots, which may help to bridge the gap between humans and robots and open entirely new application areas in medicine and beyond," said Wyss Founding Director Donald Ingber, M.D., Ph.D., who is also the Judah Folkman Professor of Vascular Biology at Harvard Medical School and the Boston Children’s Hospital Vascular Biology Program, as well as Professor of Bioengineering at Harvard’s John A. Paulson School of Engineering and Applied Sciences (SEAS).